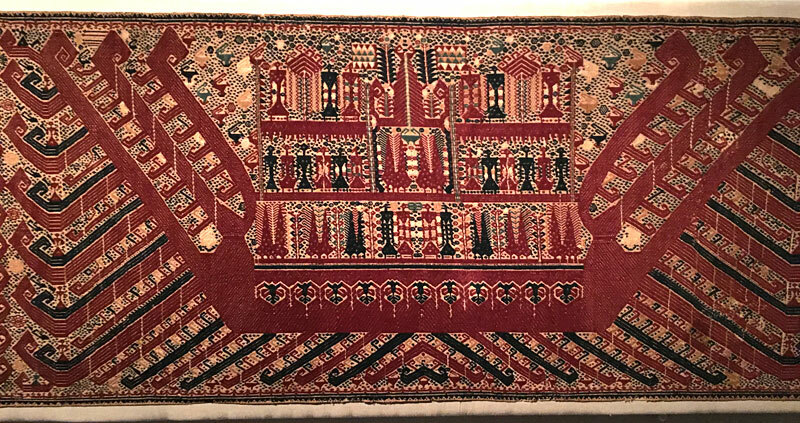 A recent exhibition of Sumatran (Indonesian) ceremonial hangings in cotton and silk from the 19th century at the De Young Museum in San Francisco made me wonder whether such textiles were also in vogue in another maritime culture, the ancient Indus, whose boats would not seem out of place in these examples. One can imagine that ships in abstracted profile, much like a stamp seal, may have featured as design elements and centerpieces, and could have been flown from shipping vessels as well. They could have said something about the identity of the passengers and goods, like flags do today. And they could have had enormous ceremonial function as well, as these Sumatran examples made clear to me. 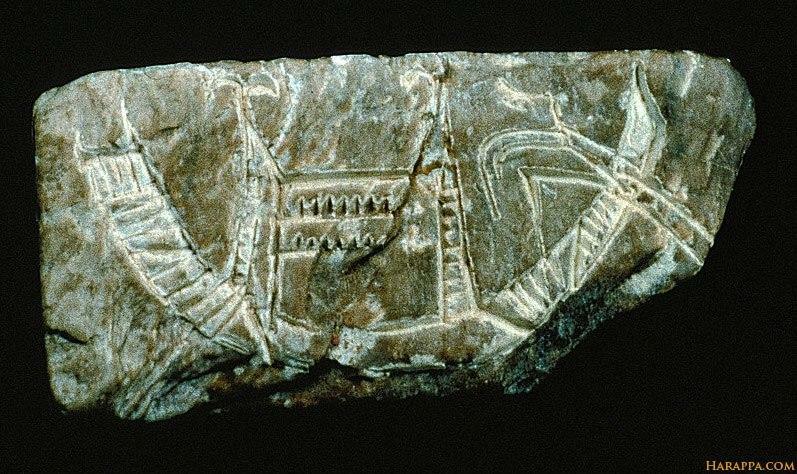 The description of the first example , a 'Ceremonial Hanging' or palepai is not far-fetched for 2300 BCE: "This cloth depicting two large ships with sweeping oars is masterfully woven with finely detailed human figures, mythical creatures, birds, and ancestral shrines. The multilayered decks may represent cosmological or social stratification. The cloth was likely used in an aristocratic marriage ceremony, with each of the two red ships representing a clan. 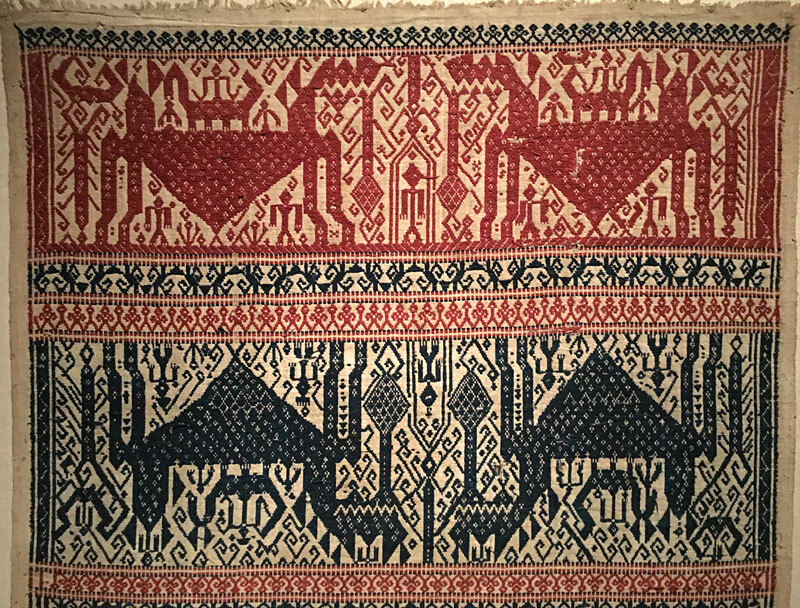 During the marriage rites, a single-ship palepai would replace such a double-ship cloth to symbolically represent the merging of the clans." 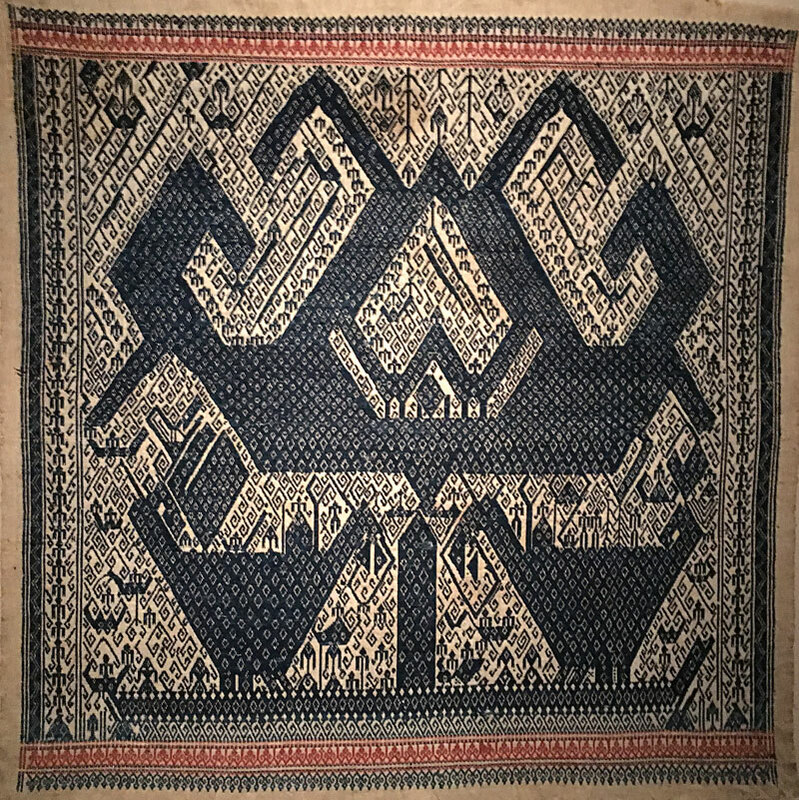 The second cloth is of handspun cotton, plain weave with a supplementary-weft patterning known as a tampari, for the common people as opposed to the aristocratic class that preferred the palepai: "During transition rites–such as presentations of newborns, circumcision ceremonies, weddings, and even elopements–dozens of tampan would be exchanged between relatives, often being used to wrap food or other gifts. Accordingly, tampan display a wider range of motifs and thus do not find themselves to such discrete classification as the palapai." 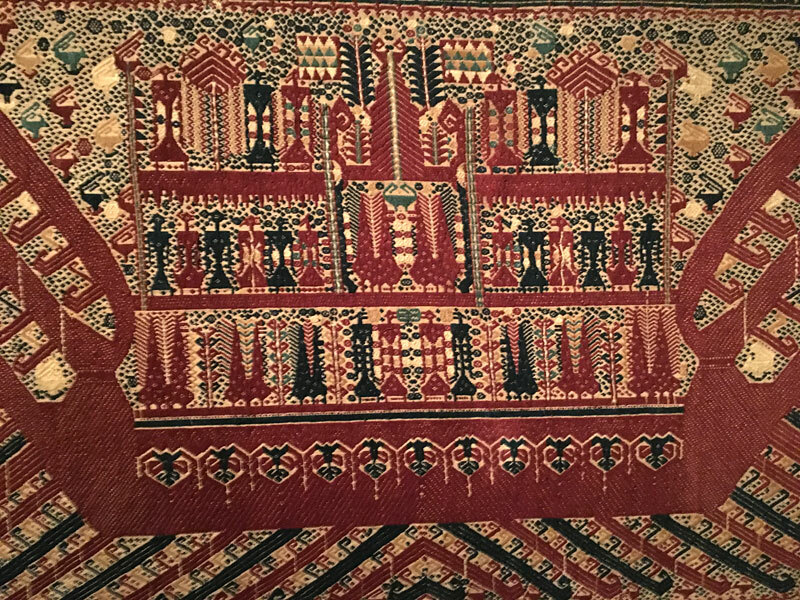 The third example, a gorgeous tampan also of handspun cotton, plain weave with supplementary-weft patterning would not be out of place in modern Sindh, Gujarat or Rajasthan. The last two images are boat profiles from Mohenjo-daro. 5. 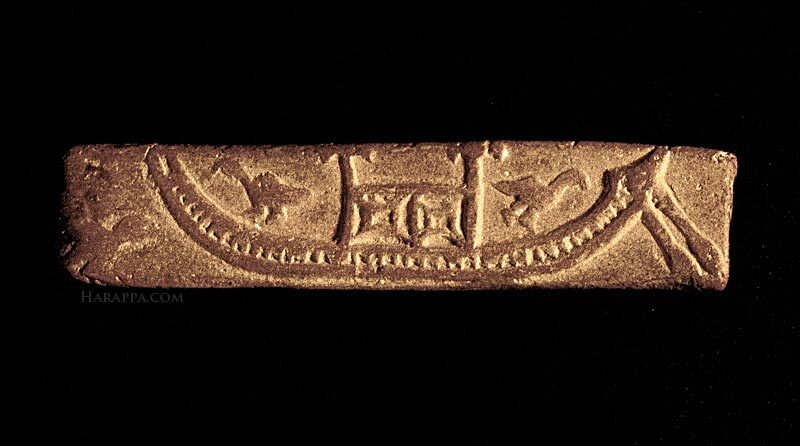 An unfired steatite seal of a boat found at Mohenjo-daro. 6. Moulded tablet, Mohenjo-daro. One side shows a flat bottomed boat with a central hut that has leafy fronds at the top of two poles. Two birds sit on the deck and a large double rudder extends from the rear of the boat. More about these items at the De Young's The Sumatran Ship Cloth.